We had a fantastic guide who was very experienced and knowledgeable. I don't recall his name right now (Kyle?). My wife thought he looked like Harrison Ford. Anyway, during the more relaxed sections of the river there was time for discussion. 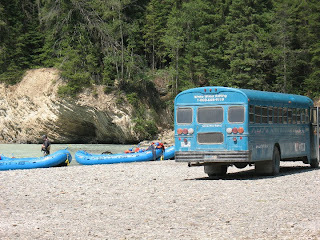 During one of these 'lulls' Kyle asked if anyone had been rafting anywhere before. Several people had rafted previously in different parts of North America (a river in the Grand Canyon, another in California, and one or two in BC). Kyle was very interested as he had rafted one of those rivers in the past. As the discussion progressed, it turned out that Kyle had made a career out of being a river rafting guide. He was so passionate about it that when the season was over in North America, he would travel somewhere in the Southern Hemisphere (South America, Africa) and work for river rafting tours in those countries! Apparently he has been doing this for quite a number of years now. What an interesting career option for other young adults to emulate! Don't let the seasons or the weather constrain your career. Follow your passion to the side of the world where it's in season. Skiing, mountain biking, rafting, golfing, treeplanting (ha, just kidding), etc. Another example of this I got just today was to observe the number of young people from Australia and New Zealand work at the ski slopes here in Alberta and BC. Likely they can't ski in Australia in the middle of March (end of their summer). What an opportunity to come to Canada, work on the slopes, and experience another country all at the same time! Don't miss our 'Career Resources for Graduates and Young Adults' page. It has some helpful links to videos, sites, and articles related to careers and career direction for grads. Our 'Travel Resources' page is also full of links to sites for young people interested in doing some travel abroad.